When you hear the word ulcer, you probably think of the condition caused by stress that has people popping antacids to combat intense stomach pain. But another type of ulcer affects the eye. A corneal ulcer is essentially a scratch on the eye. So, what exactly are dog eye ulcers and how are they treated? Let’s learn more. What causes dog eye ulcers? Boston Terriers are especially prone to eye ulcers. Photography ©Page Light Studios | iStock / Getty Images Plus. What types of ulcers might dogs get? 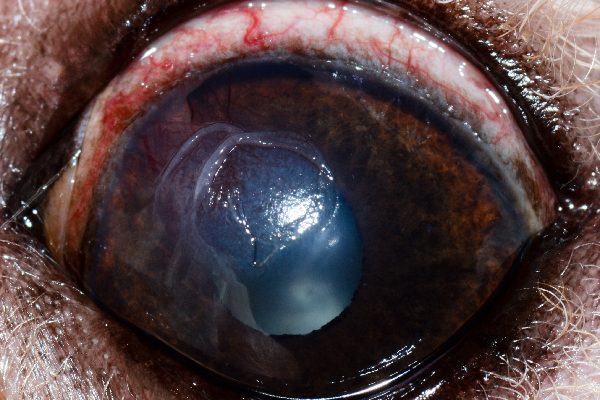 “This is a very deep corneal ulcer in a Boston Terrier,” Dr. Alario says. “As we discussed, these breeds are at very high risk of ulceration and often get complicated (infected). This photo shows a large central divot on the cornea, indicating a good amount of the stroma was lost. There is significant redness to the sclera (white of the eye) and blood vessels growing into the cornea to heal it.” Photography courtesy Dr. Anthony Alario. Corneal ulcers can be mild (superficial) or severe (deep). A superficial ulcer is a scratch on only the outermost layer of the cornea (called the epithelium). A deep ulcer is one that extends through the epithelium into the next layer of the cornea (called the stroma, which is the main connective tissue of the cornea). A specific type of ulcer that is especially concerning is an indolent ulcer (also called spontaneous chronic corneal epithelial defects, or SCCEDs). Such ulcers are only seen in middle-aged and older dogs, and they occur spontaneously. Such dog eye ulcers are seen more frequently in some breeds, including Boxers and Golden Retrievers, although they can occur in any breed. What are the symptoms of dog eye ulcers? 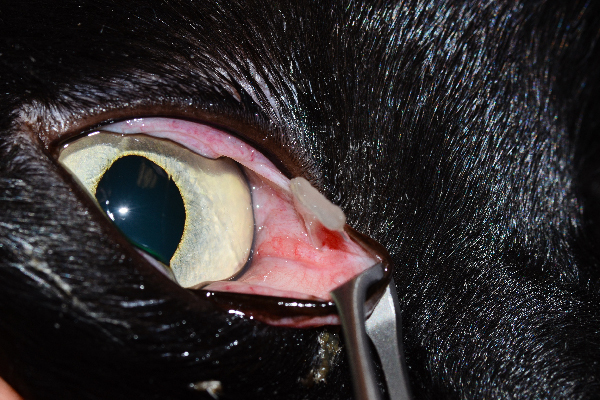 “This shows a very small ulcer on the cornea (really hard to see here), but the cause of the ulcer is that cat claw nail under the third eyelid,” says Dr. Alario. “In this case it was a cat scratch after all. [This] shows why it’s important to have the vet look for an underlying cause.” Photography courtesy Dr. Anthony Alario. “This is an example of an indolent ulcer,” Dr. Alario says. “These are the ulcers that affect older dogs (mostly Boxers). You can see there is a rip in the surface of the cornea (epithelium) but no divot. This is the type of ulcer that needs to be debrided (ideally by an ophthalmologist, though some vets can do this).” Photography courtesy Dr. Anthony Alario. 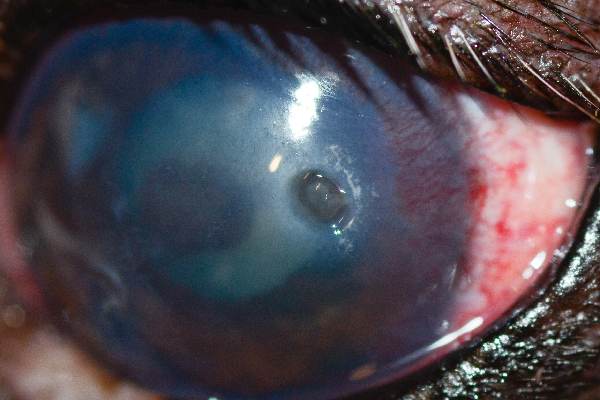 To diagnose a corneal ulcer, your veterinarian will do a special test by placing a special dye on the surface of the eye and then illuminating the eye with a blue light. If there is a break in the outermost surface layer of the cornea (the epithelium), the dye will stick to the layer beneath the epithelium (the stroma), and the scratch will be fully visible. “This is a deep corneal ulcer with a divot,” Dr. Alario says. “It was caused by that eyelid mass you see in the corner. The dog also has very small distichia (extra eyelashes) along the lower eyelid.” Photography courtesy Dr. Anthony Alario. Once medication is started, superficial ulcers should heal in three to five days. 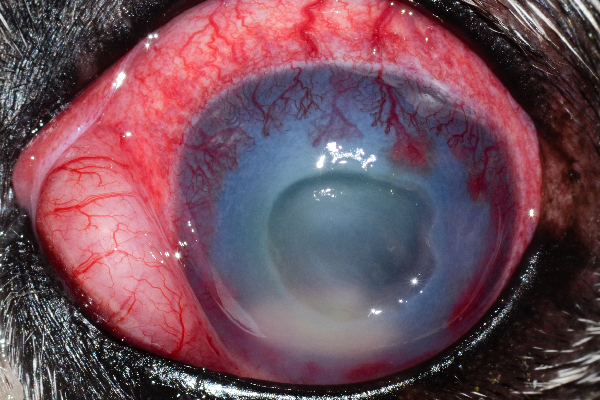 If an ulcer hasn’t healed within a week to 10 days, it’s a good idea to seek a second opinion from a board-certified veterinary ophthalmologist. These specialists only treat diseases and injuries of the eye and are especially skilled at resolving eye issues. Can you treat a dog eye ulcer yourself at home? “This is a typical deep ulcer that you can tell is deep because there is a divot,” Dr. Alario says. “There are blood vessels growing toward it on the cornea to help it heal.” Photography courtesy Dr. Anthony Alario. 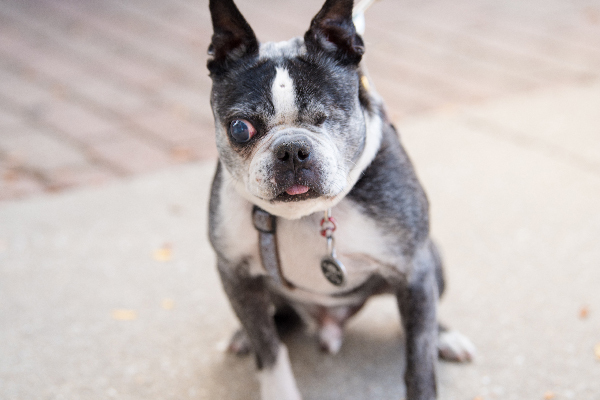 If your dog is squinting, you might be tempted to simply use some of his leftover eye drops or ointment from the last time he had an eye problem. After all, they worked the last time, so what could be the harm? “If you think that there might be a scratch in the eye, you should never use any medication that has steroids in it,” Dr. Alario explains. “A steroid can suppress the local immune system and allow infection to fester, delay the healing process, and in some dogs, it can upregulate endogenous enzymes, which essentially does something called melting the cornea.” According to Dr. Alario, the most common steroids found in eye drops are dexamethasone, hydrocortisone or prednisolone acetate. A good tip: If an eye drop or ointment contains a steroid, the bottle top is often pink or you will see a pink stripe on the packaging. Even better: If your dog is squinting, skip the at-home treatments and have him seen by a veterinarian within 24 hours. Tell us: Have you ever dealt with dog eye ulcers? Thumbnail: Photography ©madcorona | Thinkstock. 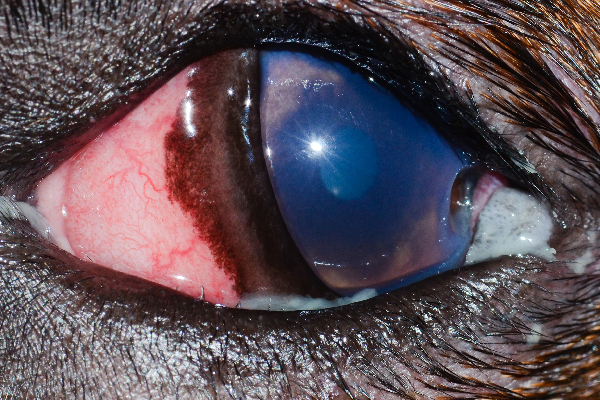 The post Let’s Talk Symptoms, Diagnosis and Treatment for Dog Eye Ulcers appeared first on Dogster.